For prepping the room, we pulled out a bunch of paint tools that have been kept in a box in the garage. After putting them in the bedroom, my super sensitive sniffer detected nasty fumes. After further investigation, I realized that some paint thinner had been put in the paint box and had leached smell into EVERYTHING in the box. I immediately threw it all out and went off to the store to purchase new materials. I’m not a paint critic and probably wouldn’t be able to tell the difference between $5 paint and $50 paint but there are 2 things that I do notice: coverage and smell. The Harmony paint was great, it didn’t dry too quickly or tacky and required 2 coats. The one thing I didn’t expect was the smell. While the smell wasn’t as stinky as normal paint jobs, it was still there. With a little research, I found that Sherwin William’s website does note that Harmony paint is ‘low odor’. It lives up to it’s claim – low odor, not no odor. At the last minute, I decided to add a couple pink stripes to the room using Benjamin Moore’s Aura paint that I already had. Aura is a low-VOC paint. The Aura paint had the opposite problem of the Harmony paint. It had very, very little odor ( they claim it is ‘low odor’ ), but it dries very fast and is somewhat tacky. I had to make sure that I got to drips very quickly. Overall, I’m thrilled with the way the room turned out but a little disappointed in the lingering smell. I will be keeping the room empty and the windows open for several more days, at least. Next up is repainting the nursery for my son, due this fall. 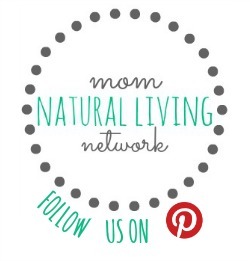 I’ll plan things a little better and make sure I can pick up the Natura paint from Benjamin Moore for his room. While the Natura paint is more expensive than the Harmony, Benjamin Moore claims that it is ‘virtually odorless’ and emits lower total volatile compounds than any other zero-VOC paint – I want to see if that’s true. Anyone tried other zero-VOC paints they can recommend? For a long time, I’ve excluded bleach from our house and found other ways to clean where I used to use bleach. I don’t like the chlorine bleach smell and chlorine isn’t good for the environment. I haven’t missed my bleach except in the laundry department where keeping stains out of my toddler’s clothing can be a challenge. A little marker here, grass stains there. Mix it all up, leave it in the laundry bin for a week and voila – permanent stain. 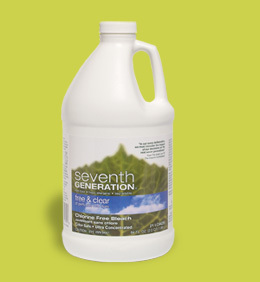 I recently was looking through Seventh Generation’s line of products and found a chlorine FREE bleach and decided to give it a whirl. My first use was for an outdoor curtain that wasn’t taken down during the last 2 winters and accumulated some mildew over the damp months. While it didn’t remove all the mildew ( and I didn’t expect it would since it’d been hanging there for 2 years ), it removed a lot of it and I was thrilled! Even though the site said the bleach was intended for laundry stain removal, the Science Man did recommend trying chlorine free bleach on tile for grout cleaning so my next task is to take it to the tile floor in my shower. I might rue the day we chose an all tile floor in the shower – it’s all little tiles so there is LOTS of grout to get mildewy. If that doesn’t work, he also recommended three different options: baking soda/water, vinegar/water or a steam cleaner. I have all three, hopefully one of them will make the job easy! So, to answer the question: To Bleach or Not? The answer is yes – but with a non chlorine bleach! I’m a Seventh Generation junkie but Ecover and Biokleen also make them. Low or no VOC paint is easy to find but unfortunately, the same options do not exist in spray paint. The good news is that there is a better choice for spray paint – Krylon H2O Latex spray paint. It’s about 25% lower in VOCs and contributes 55% less to smog pollution than traditional spray paint. H2O Latex comes in 19 colors and dries in 1 hour. An added benefit – it cleans up with soap and water. While spray paint isn’t the most eco-friendly option ( aerosol cans release particles into the air that you then breathe and the cans can’t be recycled ), there are just some things that are far easier to spray paint than paint ( wicker chairs, for instance ). If you’re going to spray paint, you might as well choose the best option and right now, it’s Krylon H2O Latex. 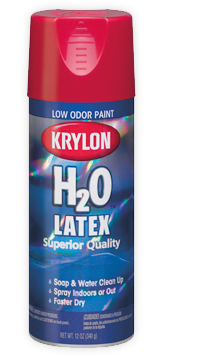 I found H2O Latex at Michael’s and Jo-Ann’s craft stores but Krylon sells their products at Ace, KMart, Sears, Sherwin Williams and many online stores. White distilled vinegar can help to dissolve mineral deposits that collect in automatic drip coffee makers from hard water. Fill the reservoir with white distilled vinegar and run it through a brewing cycle. Rinse thoroughly with water when the cycle is finished. (Be sure to check the owner’s manual for specific instructions.) Works great! Spray white distilled vinegar full strength on tops of weeds. Reapply on any new growth until weeds are dead. We tried this and found that some weeds fell over dead and a few couldn’t have cared less. I just pick those. The addition of 1 cup of white distilled vinegar to each load of baby clothes during the rinse cycle will naturally break down uric acid and soapy residue leaving the clothes soft and fresh. I particularly use vinegar on anything with urine on it. Wash fireplaces with a 50/50 ratio of water and white distilled vinegar to remove the blackened soot on glass front doors. If the doors have a spring-loaded clip, remove it, then take out the doors. Lay them flat on newspapers, spray with the vinegar/water solution and soak. Wipe it off with newspaper. I’ll be using this once we turn off the pilot light on our gas stove for the summer. It is easy to take out the heavy stale smell often found in lunch boxes. Dampen a piece of fresh bread with white distilled vinegar and leave it in the lunch box overnight. This is my new favorite vinegar use- it’s so hard to keep my daughter’s lunch bag smelling good! First, make the “cone” of the volcano. Mix 6 cups flour, 2cups salt, 4 tablespoons cooking oil and 2 cups of water. The resulting mixture should be smooth and firm (more water may be added if needed). Stand a soda bottle in a baking pan and mold the dough around it into a volcano shape. Do not cover the hole or drop dough into it. Fill the bottle most of the way full with warm water and a bit of red food color (can be done before sculpting if you do not take so long that the water gets cold). Add 6 drops of detergent to the bottle contents. Add 2 tablespoons baking soda to the liquid. Slowly pour vinegar into the bottle. Watch out – eruption time! How cool of a mom would your kids think you were! Remove the leftover odor after a rider has been carsick by leaving a bowl of white distilled vinegar overnight on the floor. Hasn’t this happened to every mom? It’s SO hard to get that smell out, particularly on hot days. Get rid of expensive ‘veggie washes’ and use vinegar, particularly for non-organic produce. Deter ants. Discourage ants by spraying undiluted white distilled vinegar outside doorways and windowsills, around appliances and wherever you find the pests coming in. These pesky critters often move in unannounced and next time I will be welcoming them with this great tip! Remove sticky residue. To remove the sticky residue from bumper stickers on your car, price tags on a new product or stickers your 2 year old put all over your window ( a recent development at my house ), use full strength vinegar. This works great and replaced my bottle of Goo Gone (saving money and the use of more chemicals than we actually needed ). For many more tips, visit The Vinegar Institute ( yes, one exists ) for their Vinegar Tips and Tricks Guide or VinegarTips.com for 1001 vinegar tips and tricks. Vinegar is so versatile – what are YOUR tips for using it? I don’t usually post twice in one day but when something gets me fired up, well then…..all bets off. I’ve spent a lot of time tonight researching mattresses and mattress covers and have come across some great information to pass on but it’s going to take a week or two to get it all together so you can expect more detail next week. Anyhow, in the process I came across a Serta organic crib mattress sold at Babies ‘R’ Us. “Impressive!”, I thought, but not for long. The mattress is made with organic cotton layers ( I’m not even sure it’s 100% organic cotton ) but it’s clothed in vinyl ( in full disclosure the mattress vinyl is phthalate free but read my post on March 26th about vinyl – nasty stuff ). To add to it, it also has chemical fire retardants in it instead of using wool, a natural fire retardant. This irritates me because the label ‘organic’ seems misleading when the organic material is surrounded with a bunch of other toxic crud. This is a great reminder to check ingredients when purchasing products because the label ‘organic’ for mattresses ( and a lot of products ) is not yet regulated. Serta – we’re watching you and we’re on to your tricks!